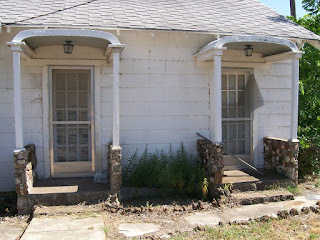 Here are a few before pics of the house. 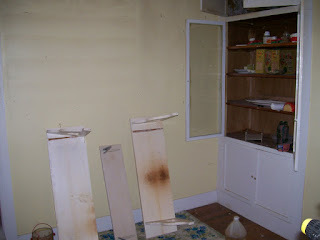 These were taken before the cleaning up and clearing out had started. The house is about 85 years old. It belonged to my great great aunt who lived to be over 100. I have childhood memories of this place and really like that I will be living in a piece of family history. 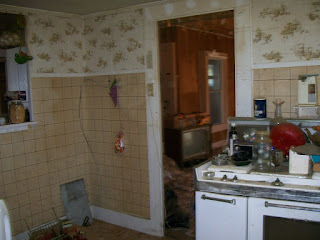 The house had been vacant for eight years. In that time, rodents had moved in and the out buildings seem to have been party central for the teenage crowd. It needs a lot of work still, but we do at least have it clean now and full of our boxes instead of Aunt V's! 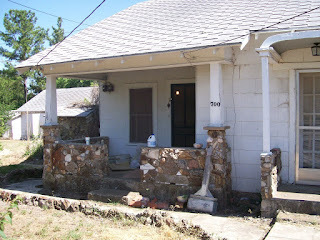 This first pic is of what we consider the front porch. The door actually leads to what was always used as a bedroom, but we do not like the idea of guests entering into one of the kids' rooms. So, at the moment, this room will serve as a temporary dining area. I wanted to use it as a den/office space, but upon further investigation, it has no electrical outlets at all. These are the two other front doors, both leading into the living room. The house was destroyed in a fire in the early 1920s, so when they rebuilt they added lots of ways to get out. This one is looking into the kitchen from the living room. The multi paned glass swinging doors are one of my favorite features. 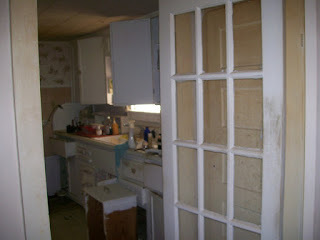 There is one leading to the breakfast nook from the living area as well. I love built in's! This house has so much potential.